With obesity and health issues on the rise, it’s important to instill good eating habits in children from a young age – not just at home, but in school too. With a new Dubai school launching a campaign to promote good food habits in their students, in partnership with celebrity chef Gary Rhodes, we take a look at what needs to be done to educate children on eating well. Try to recall what you ate in your school lunches – was it healthy? Canteen lunches have long been gaining a bad reputation around the world, and while most schools here don’t mandatorily serve breakfast and lunch, most have a canteen that don’t always offer healthy, or even enjoyable, food options for children. “Children today tend to be fussy eaters and as a result, parents struggle to make them eat a good balance of the right foods. By providing tasty, high quality meals in school and being very positive and encouraging about food, we are able to introduce children to foods that they would not normally try,” says Samantha O’Grady, Home Economics teacher at Foremarke School, the Dubai school which recently launched the Festival of Rhodes campaign aimed at promoting eating fresh, wholesome food amongst their students. Children need to be educated on the importance of eating well, and by introducing them to healthy food that is tasty as well, educators will be able to teach them how vital wholesome food is for their growth and wellbeing. And this effort needs to begin at a grassroots level. Jamie Oliver’s revolutionary Feed me better campaign which involved altering and promoting healthy eating habits in schools in Britain had made headlines the world over. Jamie wanted to show parents what their kids were eating at schools, and prove that nutritious, wholesome food could be made with as little as 37 pence per meal. Michelle Obama has also recently launched the Lets Move campaign, with the aim to fight obesity in children in the US. In 2011, Dubai Municipality introduced a ban on foods that are high in calories and sugar, contain artificial preservatives, and have a poor nutritional profile, being sold in school canteens. They have also set up guidelines that aim to educate schools on nutrition and calorie requirements for each age group. The ban has been implemented in a few government as well as private schools, but an informal poll around our office revealed that it is far from being the universal standard in all schools here at the moment. One private school, however, has taken the initiative, shifting the focus from calorie-conscious eating to high quality, wholesome food, with celebrity chef, restaurateur and TV personality, Gary Rhodes, at the helm. Gary introduced the Festival of Rhodes, a three-week course at Foremarke School this summer, to promote high-quality produce, and organic ingredients (where possible) in traditional, healthy school meals. Gary has long been a campaigner for better standards in school meals, which makes his entry into the school’s food system a positive move. In a three-week trial period to launch this programme, Gary spent time planting an organic garden with the children and conducting cooking classes, to teach them about where food comes from and how to cook from scratch. Starting with the new school term this month, the school canteen will start to serve a menu that he has created. He hopes to take this sort of an initiative to other schools as well. “It’s important to teach children the importance of eating well from a young age. Healthy eating doesn’t necessarily mean diet food – it’s all about wholesome, high-quality ingredients,” says Gary. “Foremarke will see a return to traditional school meals. Hearty soups, seasonal salads, mouthwatering mains and puddings – all the food will be cooked in a healthy manner and will be sourced from locally grown organic ingredients. With this exercise, children may see their friends eating like this and follow suit,” says Samantha. Dr. Abdulla Al Karam, Chairman of the Board of Directors, Director General of KHDA (Knowledge and Human Development Authority) also agrees. “We encourage schools to support teachers and students to lead a healthy lifestyle, so that we can all be even happier in work and studies,” he says. Healthy eating in children isn’t necessarily about eating low-fat or low-calorie food, but more about eating fresh, unprocessed food with natural sources of nutrition. The focus of introducing nutritious meals using high-quality produce in schools is not only to educate children on healthy eating, it is also to help them lead a healthier lifestyle and lower the risk of lifestyle related diseases and eating disorders later on in life. While not all schools have the facilities to grow an organic garden, or have a fully-fledged canteen with hot meals served, schools that do call in catering companies can and should choose those which offer a range of nutritious lunch items, instead of those that offer fried, or unhealthy fatty foods. Many parents prefer packing a meal for their children, as they believe that canteens which do serve hot dishes don’t offer nutritious items and skimp on the quality of ingredients in meals. 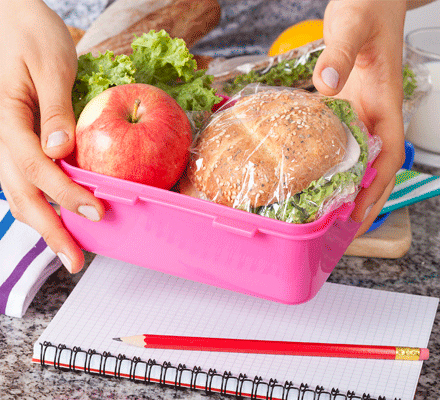 However, that is not always possible for busy working parents who don’t have a choice but to hand over lunch money to their children, so school canteens should make sure that the food they serve has age-appropriate carbohydrates, proteins, fats, minerals and vitamins – all made with fresh ingredients. Dishes should also be alternated every week, in order to see children’s response. Also, since schools in this region are home to a number of nationalities, canteens can offer a wide range of ethnic foods as well, so that children can try out other delicacies and introduce it to their family as well. Stephanie Karl, a nutritionist at JTS Medical Centre, who specialises in teenage eating disorders and food intolerances and allergies, states that canteens should offer carbohydrates like rice, potato, bread and cereal along with protein (of the same size), and swap white refined flour for durum wheat or freshly ground wholemeal flours. She also recommends using butter, coconut or olive oil, rapeseed, avocado, nut and grape seed oil instead of canola, corn, and sunflower or soy oils. Meats rich in Vitamin D and Omega 3s should be either of the grain or corn fed varieties. When teaching children about what to order in school, ask them to choose wraps with vegetables and proteins, fresh salad with meat or chicken, or corn tortillas, if on offer. Telling your five- or ten-year old to buy a vegetable wrap with chicken might be hard, but teach them that if they do buy this, they will have more energy to play, and that the food will increase their focus, to help them learn faster, and then it will make sense to them. Eating healthy also doesn’t mean going without or missing out on sweet treats. Instead of fried sweets or doughnuts, a naturally sweet snack or dessert is a healthier alternative – think chocolate mousse made with avocado, dates, cacoa and almond milk, as well as a raw pistachio ice cream bar or berry and banana sorbet, which are all delicious and nutritious too. All these can be made free from preservatives and artificial colouring if quality ingredients are used. “It’s nice to treat children every now and then, as long as the portion sizes are small,” says Gary, who recommends an apple crumble with custard or ice cream for dessert. Stephanie tells us that a balanced diet used to be about eating a little bit of everything, but these days children can be picky, as tastes have changed dramatically due to the exposure of industrially manufactured convenience foods, which are more widely available than fresh and wholegrain foods. “One of the biggest tasks as parents and teachers is getting back to basics and learning to use simple, raw ingredients, whole-grains, artisan breads, and good fats, at least 80 per cent of the time,” explains Stephanie. “At Foremarke we have established our own organic garden and have also re-introduced cooking instructions back into the curriculum with children from as young as four years old cooking in classes with older children, to cook and prepare full meals,” Samantha says. By cooking healthy at home and tuning a child’s taste buds by adding good quality, nutritious foods to their diet, and by showing them how food is made as well as asking them to help with cooking, you might find it easier to teach them the importance of eating right, while making it a fun learning experience. Parents can also show children ingredient labels when food shopping and tell them what’s bad for them (E numbers, artificial colouring and preservatives) – children tend to pick up this advice at a young age. Many children can also be addicted to the taste or textures of certain foods like milk, cereal and cheese, and Stephanie tells us that parents should keep food addictions in mind, when packing school lunches, and advising them about food from the canteen. “These foods have a pleasant opioid (psychoactive chemical that resembles morphine) effect and while it may calm the brain down, it causes inflammation or systemic sensitivities that alter behaviour and learning,” says Stephanie. The correlation between behaviour and food should be noticed, and Stephanie suggests rotating the food, along with similar alternatives, once in a four-day cycle, instead of completely omitting it from the child’s diet. It is prevalent for most kids in this part of the world to take packed lunches from home, and while home-cooked food can be a lot more controlled, in many cases, parents do not always know exactly how to give them the most nutritious options. When cooking food at home for children, cut down the amount of fructose corn syrup used in dishes, and refrain from store-bought tomato or chilli sauce, and salad dressings packed with artificial colourings, preservatives and sugars. Instead, try and make things from scratch whenever possible. This way your child will learn to tell the difference from good quality ingredients and store-bought varieties. Snacks at school can be a fresh fruit, yoghurt, protein bar, boiled egg, raw vegetables with hummous, corn crackers with guacamole or salad, and cheese slices or toasties made with wholegrain bread, proving good food doesn’t necessarily have to be expensive. While eating well is key, children also need to keep hydrated throughout the day. A large bottle of water should be kept on every desk, and each classroom should be equipped with water dispensers so that children can help themselves as and when they want. Stephanie recommends milk as well, but suggests staying away from juices with artificial sweeteners and sugars. To make food interesting for children, parents need to get innovative with presentation too, as do school canteens. Which child doesn’t like a panda made out of pancakes and berries, or sandwiches cut in the shape of stars or bears? Creative food art not only adds a sense of humour to meal, but also intrigues children in many ways, making them willing to try out something new, making it a great way of introducing new vegetables, fruits, grains and proteins into their diet. At the end of the day, it isn’t an easy job to get children to eat healthy, but the important thing to remember is, if the food is tasty, they are more likely to accept it. And it isn’t hard to make fresh, wholesome food taste good. It just needs a concerted effort between parents and educators to ensure that our kids are getting the best nutrition they can. Portion control: Teach them not to stuff themselves if they are already full, as it might make them feel lethargic at class. Stick to the box: While it’s fine to share with friends once in a while, it’s best to teach your child to eat from his/her own lunchbox – especially if they are allergic to certain foods that might be present in another box. Stay away from junk: Give your child a high-quality, homemade burger or pizza from time to time, so that they don’t crave it and indulge in unhealthy fast food at school when you aren’t around to watch over them. Snack right: Tell them to choose a fruit, yoghurt, or vegetable sticks with hummous over a bag of fried chips, as it is tastier and will keep them full for longer as well – so they won’t feel hungry in another few hours.